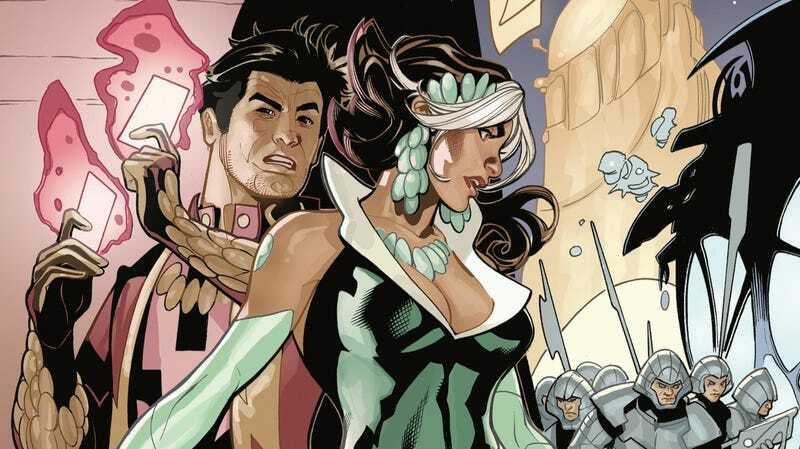 After hijacking Kitty Pryde and Colossus’ wedding in X-Men Gold #30, the newly married Rogue and Gambit have embarked on a honeymoon that has gone about as well as these things normally do for superheroes. Which is to say it’s been a total disaster. They decided to go to space to get away from all the drama on Earth, but they inadvertently put themselves in the middle of a cosmic conflict involving the X-Men’s occasional allies, the Shi’Ar, and a new face with a deep connection to the mutant team: Xandra, the daughter of Charles Xavier and former Shi’Ar leader, Lilandra. Written by Kelly Thompson with art by Oscar Bazaldua and colorist Frank D’Armata, Mr. & Mrs. X is a fun, flirty superhero comic that delights in continuity, using plot points like Deadpool and Rogue’s brief romance in Uncanny Avengers to add new hurdles to the honeymoon. This exclusive preview of next week’s Mr. & Mrs. X #4 begins with the lovers dangling upside down as prisoners of the Shi’Ar, but they’re able to escape with a kiss that passes a lock pick from Rogue’s mouth to her new husband’s. Thompson’s talent for writing banter reinforces the relaxed, playful dynamic between Rogue and Gambit, and she blends humor, romance, and outer space intrigue to build a rich story around a compelling central couple. Bazaldua blends nuanced character acting with exciting action in his artwork, with D’Armata’s vibrant pastel palette accentuate the lighter tone of the series. Thompson is getting ready to disassemble the X-Men for the upcoming Uncanny X-Men relaunch, but Mr. & Mrs. X is all about bringing characters together for an interstellar thrill ride.